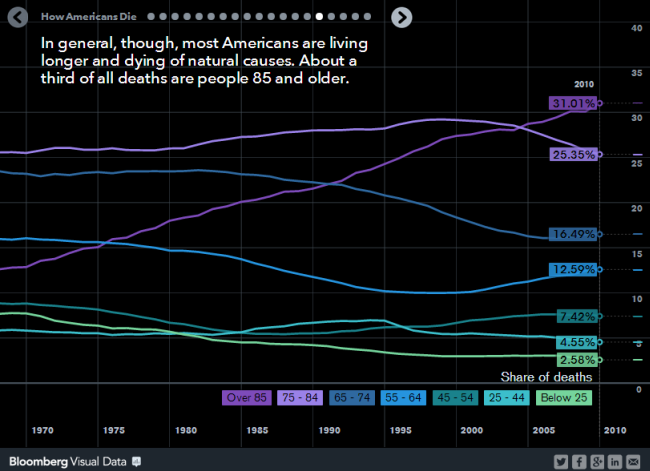 Americans aren’t dying like they used to. They’re living longer, and more are dying of natural causes. In 2010, nearly one-third of all deaths (31%) came from people ages 85 and older – a big improvement from 1968, when the 85+ age cohort made up just 12.6% of deaths. But the downside of living longer is the higher rates of dementia, senility and Alzheimer’s in the population, which are also more costly. In 2010, the Centers for Disease Control and Prevention documented 180,021 such cases compared with just 293 such cases in 1968. The findings come from a series of charts in a new Bloomberg slideshow, “How Americans Die” (whose cover page of a foggy cemetery is almost as cheery as the title itself). Bloomberg weaved together data from the health world to form a statistical portrait of U.S. deaths. They explored trends such as the narrowing ‘mortality gap’ between men and women, the increase in suicides and drug-related deaths among 45- to 54-year-olds, and the spike in deaths in the mid-1990s among those ages 25 to 44 due to HIV/AIDS. The interactive tells a larger trend story and also more detailed ones in between, such as the impact of HIV/AIDS in America. In the mid-90s, HIV/AIDS became the leading cause of death among those in the prime years of their lives. At its peak in 1995, it killed over 40,000 Americans, over 30,000 of whom were 25- to 44-years old. Those numbers – which were especially high among black men – dropped in 1997, and continued to decline. In 2010, some 2,639 people in the 25- to 44-year-old cohort died from AIDS, as did 5,730 people of other ages.